Documents are typically laminated on both sides but may only require a film on the front, depending on the application. Two sided lamination provides additional rigidity and protection to prints including professional documents, menus, flyers, and more. D&K recommends utilizing Polyester films due to the rigidity, durability, and excellent finish these films provide.Polypropylene films can also be utilized for a cost-effective document laminating solution. Documents requiring only one sided lamination should utilize a Nylon film for its stable and non-curling properties. 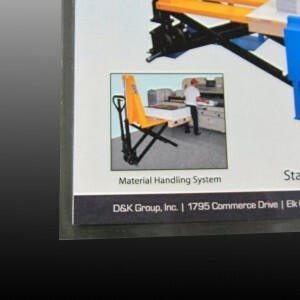 For the most durable finish that stands up to frequent handling and even cleaning, documents should be encapsulated (laminated with sealed edges that typically extend 1/4″ or less from the edge of the print).